3. Display - 5.7" HD+ display, brightness, contrast, color temperature, sRGB coverage, etc. 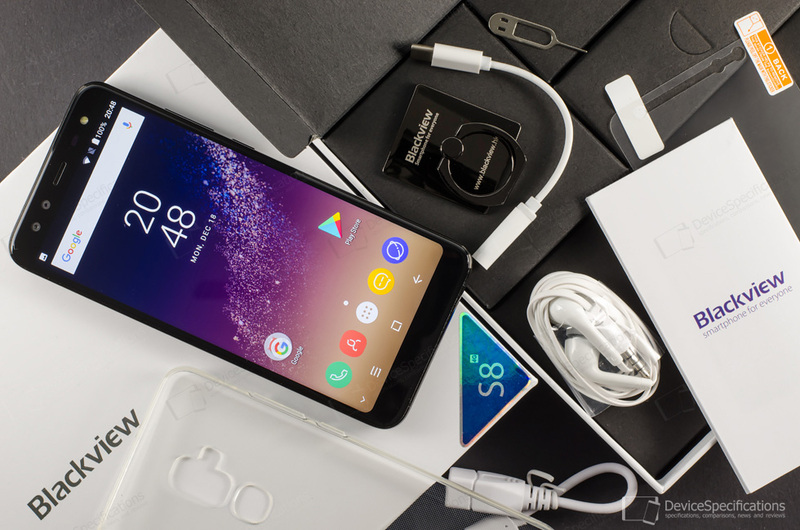 Blackview S8 is yet another smartphone that draws inspiration from the Galaxy S8 but the resemblance with the original is only in the name. So we're not going to waste time making parallels but will put the device through our usual routine of tests, measurements, benchmarks and research in order to provide an unbiased feedback on its capabilities, positive features and flaws. 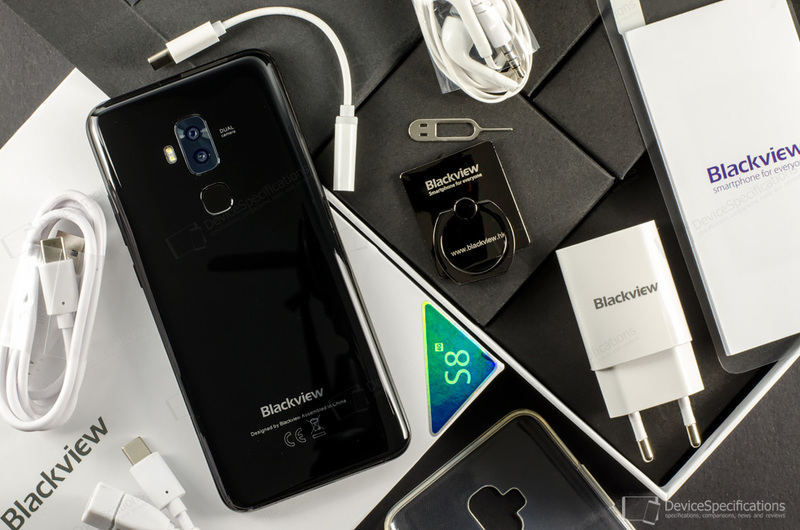 Get a black Blackview S8 at a promotional price here. Blackview S8 is built around a 5.7-inch IPS display with an HD+ resolution (720 x 1440 pixels) and a 2.5D curved cover glass. Hardware-wise, the model is based on a 64-bit MediaTek MT6750T system-on-chip. Its CPU has two quad-core clusters with Cortex-A53 cores. The first ticks at 1.5GHz and the second - at 1GHz. The graphics department is governed by a dual-core Mali-T860 MP2 GPU clocked at 650MHz. There are 4GB of single-channel, LPDDR3 RAM clocked at 833MHz and 64GB of built-in memory that can be expanded with up to 128GB. The camera department features two rear shooters. The main one is equipped with a 13MP Sony IMX258 Exmor RS sensor and a 5-element lens with an f/2.0 aperture. The auxiliary rear snapper has a VGA GalaxyCore GC030 sensor. The two are aided by a dual LED flash and phase detection AF. There are two cameras with a LED flash on the front as well. The main selfie camera relies on an 8MP OmniVision OV8856 sensor (interpolated to 13MP) with an f/2.2 lens, while the auxiliary front snapper has the same VGA GC030 sensor as the second rear shooter. A 3180 mAh battery with a 5V/2A fast charger keeps the lights on. Blackview S8 supports the following network bands: 2G GSM (850, 900, 1800, 1900 MHz), 3G W-CDMA (900, 2100 MHz), 4G FDD-LTE (800, 900, 1800, 2100, 2600 MHz). The model also supports VoLTE and provides Cat. 6 4G speeds. Its wireless connectivity options include dual-band Wi-Fi 802.11 a/b/g/n, Wi-Fi Hotspot, Wi-Fi Direct, Wi-Fi Display, Wi-Fi Calling, Bluetooth 4.0. GPS and GLONASS are supported as well. The device features a rear-mounted fingerprint sensor, a USB Type-C 2.0 port, single bottom-firing speaker, a hybrid, dual-SIM tray and no 3.5 mm jack.